The tight pants. The hot licks. The hair. Oh my goodness, the hair. I’m talking about that most cherished of musical epochs: the glam metal era, spanning from roughly the late 1970s through the early ’90s, peaking with the excessive flash of ’80s stalwarts like Poison, Twisted Sister, and Ratt. Everything was bigger, louder, faster, and sexier. It was awesome. And oh, was it catchy. If the style was trying to go out with a bang, it did so in fine fashion, with Warrant folding in all of the extravagance and innuendo it could into a tidy 3:21 package. Crunchy guitars, lyrics originally penned on the back of a pizza box, and a melody that could have been stripped from Def Leppard’s “Pour Some Sugar on Me” all combined to get stuck in your head and rocket up the charts. And did I mention the innuendo? Everyone knows “Swingin’ in the living room, swingin’ in the kitchen” wasn’t a reference to golf practice, while “So I mixed up the batter and she licked the beater” was about baking up some good lovin’, not just some pie. It was all so gratuitous and over-the-top, yet appealed to such a base instinct as to make it wildly popular. And that base instinct is what I come back to when I throw the new Dynamic Discs midrange bearing the “Cherry Pie” creator’s name. I’ll throw the new Warrant on the front porch, or on the lawn, and it will make me feel damn good. You could say it might make a grown man cry. Even from a standstill, the Dynamic Discs Warrant easily comes to rest in putting range. With a the familiar low profile-plus-bead construction of its company predecessors, the Warrant completes the Dynamic Discs midrange family as a truly understable mold. Labeled with Speed 5/Glide 5/Turn -2/Fade 0 numbers, it is currently available in the brand’s tremendous Lucid plastic, a transparent premium polymer that offers a combination of stunning looks and phenomenal grip. Out of the box, the first quality I noticed about the Warrant is that, as opposed to the Lucid Evidence that was also released last year, it has a slight dome to the flight plate. Now we’re not talking a huge bubble or anything, but it was enough of a difference to affect both how the disc felt in the hand and, in my opinion, how it looks in the air. The added dome gives the Warrant’s flight more float than fire, if you will, making it appear that it takes a little longer to get to its destination than other molds in the family. Still, it covers the same amount of ground. The Warrant requires anything but power, but still manages to be well-controlled. It’s everything you want out of an understable midrange. With all of its obvious uses – those smooth turns I’ve already written about; flip-to-flats with zero fade; powered-down lasers – the Warrant shines as a midrange that straddles the line between workable understability and utility flippiness. It has kicked the Westside Tursas – a fine mid in its own right, but sometimes too understable – out of my bag, filling in a necessary slot with a mid that I feel I can trust more than others in the class. And a lot of that trust was built on the places on the course you need it most: standstill shots with horrible footing. Now, sure, if I hit the fairway with all of my drives then bad footing would never be an issue, and the need for the Warrant would be moot. But asking me to hit every fairway is like asking Bret Michaels to shed the eyeliner. And for those times when I need to get back into the fairway – or onto the green – from a less-than-ideal lie, the Warrant is a cool drink of water, such a sweet surprise. Over the holidays, for example, I played Taylor Mountain in Santa Rosa, California with my dad. My drive off Hole 5 faded and rolled down a hill a bit, leaving me in a swarm of mossy rocks and loose dirt about 150 feet from the pin. This distance is normally putter territory, no question. But with the poor foundation under my shoes and the gradual incline, I reached for the Warrant. 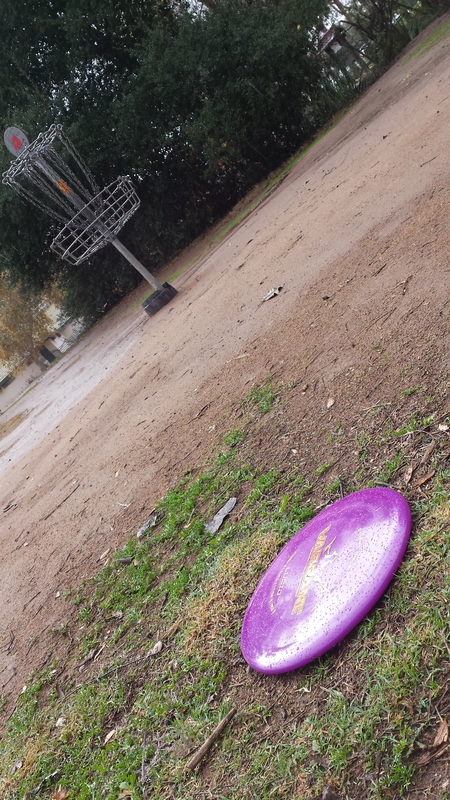 Giving it a little hyzer from a standstill release, the disc rode just over the hill and out of sight. As I approached its landing spot, I was quite pleased to see that it was within 10 feet of the basket. I’ve used this same standstill shot numerous times at Kit Carson Park, as well, where the gopher holes on the Hole 4 fairway make a run-up a non-starter. Easy release, a slight flip and turn, and the Warrant settles into easy putting range. In the couple months that the Warrant has been out in the wild, I have seen players of varying skill levels use it, all with more than a modicum of success. I had the good fortune to play Tom Brown Park in Tallahassee, Florida in December, and I let a friend of mine use the Warrant off the tee for the whole round. He had played disc golf only once before – probably a decade ago – so he was the quintessential beginner. And while he wasn’t crushing drives or anything, he was able to get the Warrant out to 100 or 150 feet off the tee. Most importantly, it was flying straight the entire time, which is exactly what a new player needs to get he or she coming back to the sport. A friend’s wife has also taken to using the Warrant as a replacement to the Latitude 64 Fuse she used to drive with. With the Warrant, she is getting more distance with the same straight-line accuracy as she was with the Fuse, with some nice s-curves thrown in for good measure. It perfectly fits where she is with her game. Even power players can find it useful, if a little touchy. My buddy Mike has bagged the Warrant as his long-sought complement to the Truth, as he has been looking for an understable mid that will have a similar feel and legs. He told me he is having a little bit of trouble trusting the Warrant right now, but I’ve seen him mash it off the tee just by playing with the release angles. I imagine that, given a little patience, he’ll see the same reliability that us mere mortals do now. It is this mass appeal that wraps this whole review into a tidy package. Much like the pure excess of “Cherry Pie” referenced above, the Dynamic Discs Warrant serves up some love that any disc golfer can appreciate. Sure, it’s more subtle, and it won’t get stuck in your head, but it should find a home in your bag. Don’t even try, because you can’t ignore it. 3) LIKE and COMMENT on the pinned post for this review at the Noodle Arm Disc Golf page. For your comment, tell me your favorite ’80s/’90s hair metal song. Like being talked dirty to, or maybe want to be rocked like a hurricane? Let me know, but don’t bring any of that Wham! garbage into the mix. The contest will run until Thursday, February 18 at 9 p.m. PDT, when a random winner will be chosen. Thanks to Dynamic Discs for providing the plastic! By clicking on the “BUY ONLINE” link above you can help keep Noodle Arm Disc Golf humming along. When you make a purchase at Infinite Discs after clicking on my link, the fine folks at the Logan, Utah-based retailer will contribute a portion of the sale to help support this site. It won’t cost you anything extra, and it’s a simple way to help me keep pumping out reviews. Thanks for the support! Wow! Fantastic review on Warrant! And on the Warrant disc too! My fav 90’s hair metal song is Metallica’s Nothing Else Matters! Cuz when I play disc, nothing else matters! I currently throw a DD Truth as my midrange and would really like to try the Warrant!! Keep up the awesome reviews!! Poison by Alice Cooper Is my song choice. 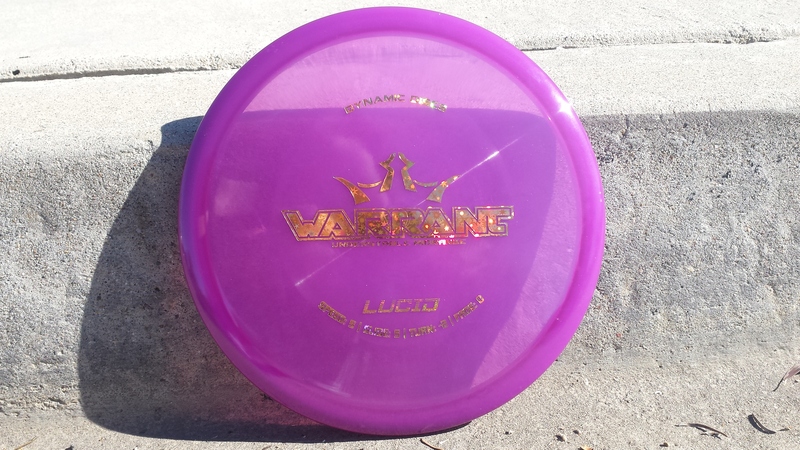 Thanks for the review, been thinking about adding this disc. Love the Truth and looking for something more understable. Tried the Witness but it’s a bit too much.